MP3 to other audios - Convert MP3 to AAC, AC3, AIFF, APE, AU, FLAC, M4A, MP2, OGG, RA, WAV, WMA, etc. MP3 may be the most popular digital audio format for the transfer and playback of music on digital music players, no matter portable or on PC. 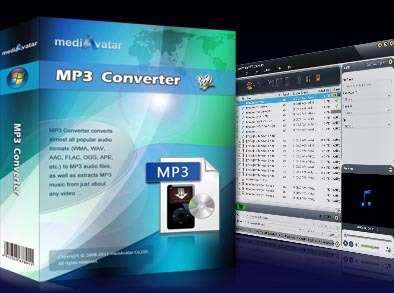 mediAvatar MP3 Converter is just designed for MP3 music playback, with which you can convert MP3 to many other audio formats (AAC, AC3, AIFF, AU, M4A, MP2, MP3, OGG, RA, WAV, WMA), convert other lossless or general audio formats to MP3 (FLAC/APE to MP3), convert video formats (AVCHD, MTS, M2TS, HD MKV, AVI, MPEG, WMV, MP4, FLV, MKV, H.264/MPEG-4, DivX, XviD, MOV, etc.) to MP3 music, and convert between other audio formats. Besides, mediAvatar MP3 Converter allows you to adjust sound effects (fade-in, fade-out, volume normalize, band pass, chorus, flanger, echo and speed), clip and convert MP3 audio segments, split MP3 music averagely, and output different audio formats for the same file simultaneously. Want to explore more? Have a trial now. Convert popular lossless or general audio formats (WMA, AAC, WAV, CDA, OGG, FLAC, APE, CUE, M4A, RA, RAM, AC3, MP2, AIFF, AU, MPA, etc.) to MP3 music or other audio formats, enabling them to be played on most music players, portable or on PC. Not only convert WMA/APE/FLAC to MP3, but also convert MP3 to other audio formats including AAC, AC3, AIFF, APE, AU, FLAC, M4A, MP2, MP3, OGG, RA, WAV, WMA, WAV lossless, WMA lossless. Convert AVI, MPEG, WMV, MP4, FLV, MKV, H.264/MPEG-4 AVC, AVCHD and many other HD/SD video formats to MP3 music, or to AAC, AC3, AIFF, APE, AU, FLAC, M4A, MP2, MP3, OGG, RA, WAV, WMA, WAV lossless, WMA lossless formats. Not only convert music files for iPod, iPad, iPhone and PSP, but also transfer the outputted music files to these devices directly after MP3 audio conversion. Accelerates the MP3 conversion speed by multi-core CPU processing, multi-threading and batch processing. Fix the sound effects from the fade-in, fade-out, volume normalize, band pass, chorus, flanger, echo and speed. Many options are adjustable. Different audio formats apply to different music players with different qualities. Set different audio formats as output for the same file to get them converted simultaneously. When converting MP3 music, you can extract as many music segments as you want and respectively convert these music segments to music formats you want. For playback convenience, split a large file into several parts according to preset split duration or size. Edit ID3 tag info, add lyrics for your MP3 music files. Or customize the output audio parameters to change the final effect of your MP3 music files. Ability to auto exit application, shut down, hibernate, stand by system, or do nothing after the MP3 conversions are complete. mediAvatar helps to convert almost all popular audio formats to each other and extract audio from most video format files for playing on multiple digital players.